Copyright &copy; The Institute of Electrical Engineers of Japan. All rights reserved. 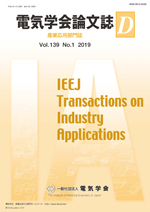 Non-subscriber of IEEJ Transactions on Industry Applications can download the full text document (PDF) through Purchase Menu of J-STAGE; the price is 2,057 Japanese Yen per paper. But the annual membership fee for the Institute of Electrical Engineers of Japan (IEEJ) is 10,000 Japanese Yen (general member). This membership enables you to subscribe to the journal of the Technical Society to which the member belongs. If you buy six papers or more of the IEEJ Transactions on Industry Applications, it costs more than the membership fee. So do not miss this opportunity and join the IEEJ ! A member of IEEJ can access the transactions of the Technical Society to which the member belongs. Please enter the My Page login ID in the subscriber number column and the birth date (year/month/date with one-byte characters: for example, 19800303) in the password column. Produced and listed by : Sanbi Printing Co.,Ltd.